Verala Development Society (VDS) was established in 1969 as a grassroots organisation dedicated towards development of deprived communities. The organisation draws its lineage from the freedom struggle. VDS has offices in Sangli and Kolhapur and covers the villages in and around these districts. Since its inception, VDS has worked on various projects focusing on agriculture and land related issues, infrastructure development, housing projects and so on. As a general practice, VDS initially charts out a budget and prepares a project report detailing the scope of work and area to be covered. The report is submitted to prospective donors for approval and sanction of funds. On receipt of the funds or grants, VDS initiates the project. Currently, VDS is working on two projects, namely, Women and Child Rights Campaign (WCRC) and New Incentives. Under the WCRC programme, VDS aims to combat the incidence of child labour and support women to procure privileges from government. These entitlements accrue from government programmes but do not reach the intended beneficiaries due to system weaknesses. In FY13, VDS in collaboration with the police conducted three raids and rescued fourteen child labourers. VDS also organised 495 women from ten villages and helped them fight for their rights. The women are provided with vocational training to help them generate sustainable income. New Incentives is yet another ongoing project of VDS. Under this project, VDS aims at providing education incentives to underprivileged students from Standard I to X. Every year, subject to availability of funds, a four month programme is conducted by VDS to educate children of migrant workers employed at the local brick factory. In FY13, VDS received a project grant from Gandhi Worldwide Education Institute (GWEI) on behalf of another NGO. The project was handed over to VDS as the other NGO could not receive foreign funds (no FCRA registration). VDS only monitors the project on behalf of the NGO concerned. 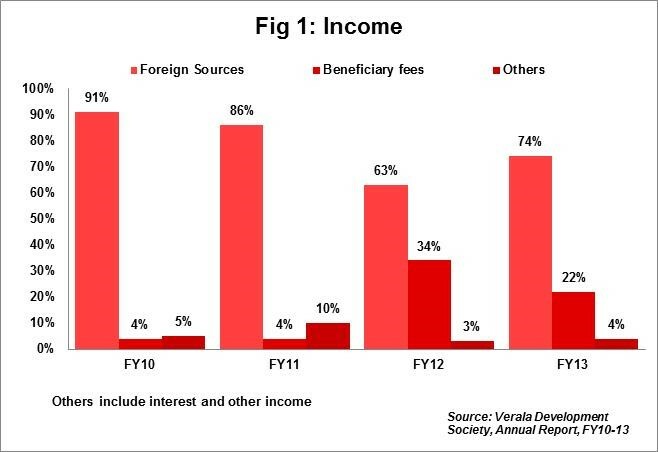 Foreign Sources: In FY13, VDS managed to raise grants to the tune of 74% (Rs0.8mn) of total income from sources such as Avert Society, Gophilantrophic and Gandhi Worldwide Education Institute (GWEI). The foreign funding has been in the range of 63% to 91% during FY10-FY12. Membership fees: As a general practice, VDS accepts advances from members in case there is shortfall of funds. Similarly, VDS also lends funds to its staff for implementation of projects and later recovers money from them. All these advances lent and received with adjustments are considered as membership fees. (Refer Fig. 1). Direct programme expenses: VDS undertakes projects subject to availability of funds. In FY13, VDS incurred only 53% (Rs0.6mn) of total expenses on programme activities (sector average: 88%) as it had few ongoing projects. 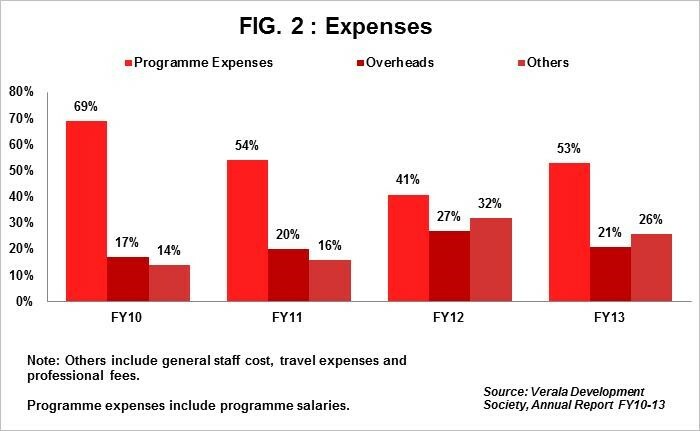 Direct Programme Expenses were in the range of 41% to 69% during FY10-FY12. The major chunk of expenses within direct programme expenses is on programme salaries as the nature of the projects demands field work of different kinds. In FY13, salaries accounted for 46% (Rs0.5mn) of total expenses and have been in the range of 38% to 52% during FY10-FY12. VDS incurs high salary expenses as outreach workers are employed to rescue child labourers and to organise women from remote areas in and around the districts of Sangli and Kolhapur. In addition, salary paid to the staff working on the GWEI project that belongs to another NGO also forms part of salaries. Overheads: VDS incurred 21% (Rs0.3mn) of total expenses on overheads (sector average: 9%) in FY13. Overheads include expenses incurred on routine administration expenses such as electricity, municipal cess, water charges, postage etc. for both the VDS offices. VDS also owns land and built- up structures which require regular maintenance. Fixed Assets and Unutilised grants: Fixed assets were to the tune of 72% (Rs12mn) of total assets in FY13. These assets were purchased against grants received in earlier years. Immovable assets accounted for 57% (Rs7mn) of total fixed assets. Unutilised grants accounted for 82% (Rs14mn) of total funds in FY13. The grants include Rs14mn utilised for purchase of Fixed Assets. Trust Corpus: Trust corpus stood at 7% (Rs1mn) of total funds in FY13. The corpus has been stable at 7% during FY10-FY12. Earmarked Funds and Current Liabilities: Earmarked funds include depreciation fund, building fund and Kavita memorial fund and constitute merely 1% (Rs0.1mn) of total funds. In FY13, current liabilities accounted for 11% (Rs1mn) of total funds. These liabilities mainly comprise of advances received from members. Income growth rate: VDS posted total income of Rs1mn in FY13 registering a growth rate of 123% against negative growth of 39% in FY12. Despite the sharp income growth, VDS witnessed deficit in FY13 which further added to its accumulated deficits. VDS recorded a CAGR of negative 1% for its income during FY10-FY13. Self-sufficiency ratio: The ratio measures ability of an organisation to meet expenses from its own funds. Own funds include individual donations, membership fees, interest and other income. The self-sufficiency ratio works out to 24% in FY13 as most of VDS’ income comes from foreign sources. Sustenance: VDS has been in existence for more than four decades but continues to be quite small and manages to raise funds of about Rs1mn only p.a. which creates uncertainty regarding its growth. However, VDS has managed to garner support of foreign donors in the past four years as is evident from the funding breakdown during FY10-FY13 (foreign income was 63% to 91% of total income). Lack of funds: The major challenge is lack of liquid cash. VDS owns land and built up structures to conduct activities such as residential school for deprived children. However, day to day functioning and execution of programmes need funds on regular basis which is a challenge. Bureaucracy: The executive committee had decided to create liquid cash for execution of programmes by disposing off a piece of land which VDS is not in a position to use. VDS has been following up to get government clearance for past three years. However, no success has been achieved so far on account of bureaucratic delays. VDS’ committee has members from diverse backgrounds. Shri Arun Chavan, founder director of VDS, M.A. DSC, has rich academic experience as a lecturer and university registrar. He has dedicated himself towards social work from 1967 and was associated with organisations such as Zilla Parishad & Regional Planning Committee, and CAPART, New Delhi. Other members of the committee are well known in their community and have been a part of various community programmes. The committee meets four times a year. VDS has received a letter of appreciation from Mr. Appasaheb Pant, Indian Ambassador in Italy. VDS also featured in local Gujarati newspaper for its work towards earthquake affected regions in Gujarat. Mr Chavan is a recipient of John Dalvi Award-Citation.